History lovers think we know this story backwards and what drove these two feuding queens. 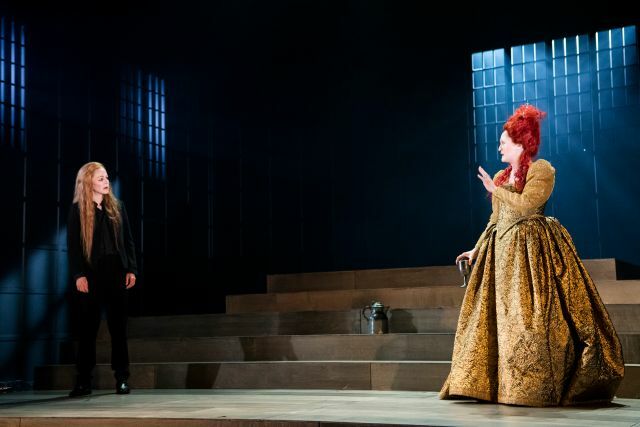 Friedrich Schiller’s classic play from 1800 has Mary Queen of Scots and her cousin Elizabeth I actually meeting each other and scratching at their veneers. Kate Mulvany’s remarkable translation, with its modern, feminist and often comic eye, goes a lot further. The queens repeatedly complain they are pawns and victims in a man’s world, where there’s little room left for one of them, let alone two. One of our finest comic actors, Helen Thomson, really lets it rip with Elizabeth. She may start in her all male court as a diplomatic if wittily sharp-tongued dissembler, but midway is on all fours, drunken, broad and foul-mouthed. The laughs keep coming even if the inner soul and strategizing of Elizabeth, except perhaps in a final soliloquy, is muffled. It’s not ‘my’ imagined Elizabeth but Mulvany’s world, stretched between 1587 and 2019, certainly takes us new places. Mel Page dresses all the male courtiers in foreboding Puritan black with white ruffs, except for the spivvy-suited Mortimer (Fayssal Bassi), later exposed as a Catholic assassin. 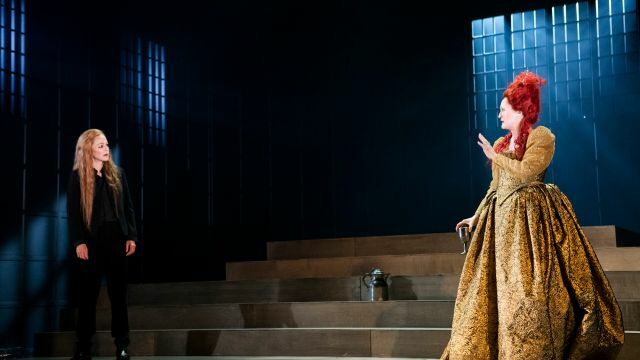 Imprisoning both queens is Elizabeth Gatsby’s effective platforms enclosed by tall walls with high windows, and sublime lighting by Paul Jackson. Caroline Brazier as the eponymous Mary plays true to a saintly engaging veneer which just occasionally cracks to show a vile hate and frustration – her final confession before the execution is riveting. And the men are all good – Tony Cogin solid as pragmatic Burleigh, Andrew McFarlane as the ineffectual lap dog Leicester, Peter Carroll as the veteran moralist Shrewsbury, Simon Burke as Mary’s benign jailor Paulet, Rahel Romahn as Elizabeth’s terrified secretary. It’s a compelling production from the artful Lee Lewis and Mulvany, a striking 21stC take on a familiar but majestic old story about female leadership.